Saule - Goddess of the Sun. - Latvian Goddess. Saule is a Goddess of the Sun life and fertility warmth and health. 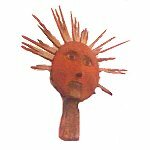 Home ¦ Divinity of the Day ¦ Latvian Gods and Goddesses ¦ Saule - Goddess of the Sun. Saule - Goddess of the Sun. Saule is a Goddess of the Sun, life and fertility, warmth and health. She is patroness of the unfortunate, especially orphans. She is found in both Lithuanian and Latvian mythologies. Meness fell in love with Aušrinė (the morning star or Venus) and was punished by Perkons, the God of Thunder. Her festival (Ligo) was celebrated at the summer solstice, which included making wreaths, looking for the magical fern flower, burning bonfires, dancing around and leaping over the fire, and greeting the sun when it rises. The winter solstice is celebrated as the return of Saulė.